The chain also just doubled its dollar menu. Fast food is usually pretty cheap. But it's usually more expensive than, say, a pack of gum. 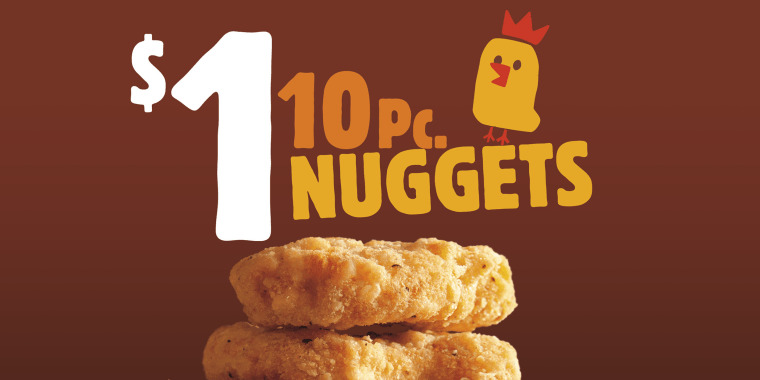 Burger King just brought out the big guns to the ongoing fast food budget battle: 10 chicken nuggets for just $1. Between, Wendy's, Burger King, McDonald's, it seems like all the big chains are at each other's throats these days. Who could forget the time Wendy's dissed it's competitors with an actual mixed tape? But Burger King's nugget deal is definitely at the top of the pecking order. A 10-piece nugget at McDonald's is about $4, and at Wendy's they're $3 (but Wendy's nuggets are a little smaller, anyway). Of course Burger King isn't the only chain trying to woo customers with super cheap food. Just last month, McDonald's rewarded mobile app users with $1 sandwiches every day for all of September. Starting Thursday, Burger King will be adding the 10-piece nugget deal to its pretty limited list of $1 items (a Burger King spokesperson confirmed the only other deal at this price is a burger). Customers will be able to enjoy 10 nuggs for $1. That's only 10 cents per nug or, like, 5 cents per bite. And if you really, really love chicken nuggets you can get a ton of them delivered right to your door. Buurger King is offering a 100-piece chicken nugget pack for $10. The 100-piece deal is available exclusively on Postmates for a limited time, along with free delivery, when hungry chicken lovers use the code, "NUGGS," between Oct. 11 and 14. Not to spoil the magic of 100-piece promo for people who aren't so good at math, but you could also just place 10 orders of $1 nuggets at your local Burger King, too. But if it's free delivery you're after, and you live in Los Angeles, Miami or Fort Lauderdale, Florida, just download Postmates on your phone, place the order and enter the code. Looks like when the King isn't busy tackling net neutrality or the pink tax, he's cooking up a lot of nuggets.